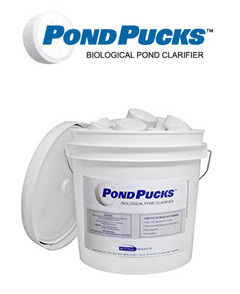 Pond Pucks are a natural, biological water treatment formulated to clarify water in ponds, lakes, and small water features while reducing muck buildup. A biodiverse group of beneficial bacteria are incorporated into the pucks to remove excess nutrients from the water column such as phosphates, nitrates and ammonia that can create an unbalanced ecosystem. Ponds containing excess nutrients are often cloudy, unhealthy and susceptible to algal blooms. Each Pond Puck contains diverse biological elements that work effectively in different water quality conditions, including facultative strains to work in low-oxygen environments.